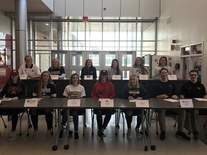 A record 13 student-athletes from Stillwater Area High School signed their National Letters of Intent to play at Division I and II colleges and universities! Congratulations! We'll be cheering you on as you take your games to the next level. Watch the video. An amazing hands on, real-world experience for Andersen Elementary fifth graders! For the tenth year in a row, students took over Leo's Grill and Malt Shop in downtown Stillwater. Watch them shake things up at the restaurant in this FOX9 video. Preschoolers from Andersen Elementary paired up with their third grade buddies to collect fleece and create tie blankets to donate to Community Thread. The students worked together to make 15 warm, fuzzy blankets, which will be given to families and individuals in need throughout the community as part of the organization’s annual holiday drive. Read more. SAHS students in American Sign Language II recently volunteered at Metro Deaf School's Annual Pancake Breakfast Fundraiser. They not only helped out a good cause, they also practiced their skills and learned about Deaf culture at the same time. Experience something special this holiday season with Stillwater Area High School music concerts! Hear your holiday favorites performed by the high school's top choir, orchestra and band ensembles. From 12 Days of Christmas to Handel's Messiah, there is something for everyone. Make SAHS concerts part of your holiday tradition! A group of elementary teachers and principals from across the district attended the Responsive Classroom National Teachers’ Conference. The theme of the conference was “Hope” and staff learned strategies to empower students, support them through trauma, respond to their cultural needs, and provide opportunities for active learning. Responsive Classroom is a program designed to help strengthen students’ social, emotional and academic growth by creating safe and welcoming school communities. All of our elementary school teachers use Responsive Classroom to help students get to know one another better, while also building relationships within their classrooms. Read more about RC online. The board will hold a work session from 1‐4 p.m. on Wednesday, November 28, 2018 for the purpose of discussing budget adjustments. The work session will be held at Central Services located at 1875 South Greeley Street in Stillwater. The board will host a meet and greet with newly elected school board members on Thursday, November 29, 2018 from 5:30‐6 p.m. at the Oak Park Building located at 6355 Osman Avenue North in Stillwater. Created by the Stillwater Area Public Schools Communications Department, 651.351.8320. This service is provided to you at no charge by Stillwater Area Public Schools. Update your E-News subscriptions, modify your password or email address, or stop subscriptions at any time on your Subscriber Preferences Page. You will need to use your email address to log in. If you have questions or problems with the subscription service, please visit subscriberhelp.govdelivery.com.